Young fans of the Pout-Pout fish series will enjoy a courage building book that shows their fishy friend conquering his fear of the dark. When the Pout-Pout fish sees his clam friend lose her precious pearl, he promises to go after it for her and bring it back. But as he follows the path of the pearl and the lights begin to go dim, his courage starts to waver. But just when it seems like he won’t be able to go on, help arrives from an unexpected source, and the Pout-Pout fish and his friend fulfill his promise and face their fear – together. 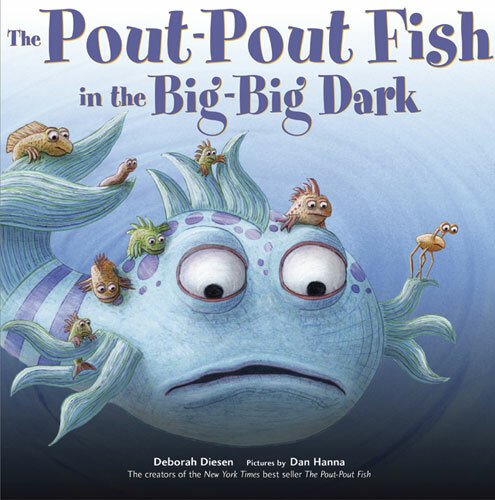 Like other books in the series, The Pout-Pout Fish in the Big-Big Dark uses repetition and rhyming to catch the attention of young readers. Rhyming verses tell a little bit of the story, and then the Pout-Pout fish repeats his manta 0 in this case, “I’m fast as a sailfish, I’m strong as a shark, I’m smart as a dolphin…but I’m scared of the dark.” Preschool aged kids will love the repetition, and novice readers will enjoy the confidence it gives when they can identify the familiar words. Though it’s definitely a series intended for younger readers, even my seven year old tester was pulled in by the brave fish’s story. The book itself is a thick, sturdy cardboard that should stand up well to the test of time, and every part of every page is covered in color or images of some sort. Because the story takes place under the sea, there are plenty of things to look at, from blue water to blooming plants to the many interesting creatures that live there. The illustrations are colorful and kid friendly, and even the fish who are trying to eat our intrepid hero come across as more cute than threatening. It all adds up to a book that is fun to read and fun to look at – just the sort of thing that appeals to young kids, and the perfect way to get them hooked on reading at a young age.